Posted by admin in activity reports, Alaska, Ambrym, Asama, Barren Island, Batu Tara, Chaitén, Colima, Ecuador, eruptions, Fuego, Gorely, Guatemala, Hawaii, Indian Ocean, Indonesia, Japan, Kamchatka, Karymsky, Kilauea, Koryaksky, Krakatau, Mexico, Pacific, Papua New Guinea, Rabaul, Redoubt, Reventador, Russia, Sakura-jima, Suwanose-jima, Tungurahua, United States, Vanuatu, Weekly Volcanic Activity Reports. 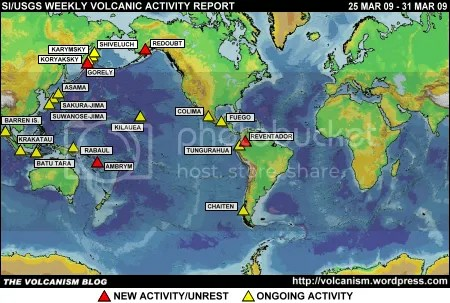 The Smithsonian Institution/United States Geological Survey Weekly Volcanic Activity Report covering 25 March 2009 to 31 March 2009 is now available on the Global Volcanism Program website. The following is a summary and not a substitute for the full report. New activity: Ambrym (Vanuatu), Gorely (Kamchatka, Russia), Redoubt (Alaska, USA), Reventador (Ecuador). Ongoing: Asama (Japan), Barren Island (Andaman Islands), Batu Tara (Komba Island, Indonesia), Chaitén (Chile), Colima (Mexico), Fuego (Guatemala), Karymsky (Kamchatka, Russia), Kilauea (Hawaii, USA), Koryaksky (Kamchatka, Russia), Krakatau (Sunda Strait, Indonesia), Rabaul (Papua New Guinea), Sakura-jima (Japan), Shiveluch (Kamchatka, Russia), Suwanose-jima (Japan), Tungurahua (Ecuador). Ambrym (Vanuatu): 25 Mar 09, ash plume to 2.1 km a.s.l., drifted ~55 km S; 26 Mar 09, ‘smoke’ to 2.4 km a.s.l. Gorely (Kamchatka, Russia): 10-27 Mar 09, seismic activity increased. Redoubt (Alaska, USA): 25 Mar 09, small explosion produced ash plume to 4.6 km a.s.l., drifted N-NW; 26 Mar 09, multiple explosive eruptions produced plumes to 6.1-19.8 km a.s.l., lahar detected in Drift Valley; 27-28 Mar 09, seven explosive eruptions produced ash plumes to 7.6-15.2 km a.s.l. ; 29 Mar 09, ash plume to 6.1 km a.s.l. ; 30 Mar 09, continuously emitted ash plumes to under 6.1 km a.s.l., occasionally to 8.2 km a.s.l. ; thermal anomaly observed at the vent, possible lava dome extrusion; 31 Mar 09, emissions of steam, gas, small amounts of ash, produced plumes to 4.6-7.6 km a.s.l. Reventador (Ecuador): 25-26 Mar 09, seismicity increased; 26 Mar 09, earthquake swarm including harmonic tremor recorded; steam emissions with low ash content observed. Asama (Japan): 23 Mar 09, weak incandescence; 30 Mar 09, strong steam emissions observed. Barren Island (Andaman Islands): 25-26 Mar 09, ash plumes to 2.1 km a.s.l., drifted ~110 km S.
Batu Tara (Komba Island, Indonesia): 25-27 Mar 09, ash plumes to 2.1 km a.s.l., drifted 30-110 km NW. Chaitén (Chile): 17-23 Mar 09, continued growth of central and southern areas of lava dome complex, collapses of unstable slopes generated block-and-ash flows, continuous steam emissions drifted N and ESE, block-and-ash flow volume smaller than the previous week. Colima (Mexico): 25-29 & 31 Mar 09: white and grey plumes to 3.9-4.6 km a.s.l., occasionally drifted SW, SE, E and NE. Fuego (Guatemala): 27 & 30 Mar 09, explosions produced ash plumes to 4.1-4.8 km a.s.l., drifted S and SW; 31 Mar 09, ash plume drifted E.
Karymsky (Kamchatka, Russia): 19-22 Mar 09, seismic activity elevated, ash plumes likely to 2.0 km a.s.l. Kilauea (Hawaii, USA): 24-31 Mar 09, lava flowed SE through lava tube system to Waikupanaha and Kupapa’u ocean entries, thermal anomalies suggesting surface flows observed; Halema’uma’u crater continued to produce predominantly white plume that drifted SW; 24 & 25 Mar 09, brown plumes emitted; 26-28 Mar 09, rising and falling lava surface detected deep below crater floor. Koryaksky (Kamchatka, Russia): 20-27 Mar 09, seismicity at background levels; gas plumes with minor ash content to 4.0 km a.s.l., drifted S, SE, W and NW; 25-26 Mar 09, gas-and-ash plumes drifted 225 km SE. Krakatau (Sunda Strait, Indonesia): 19-25 Mar 09, seismicity increased; 25 Mar 09, white-to-grey plumes to 400 m above Anak Krakatau. Rabaul (Papua New Guinea): 21-26 Mar 09, white and occasional grey plumes from Tavurvur cone rose 500 m, incandescence observed at night. Sakura-jima (Japan): 26 Mar 09, explosion produced plume to 2.1 km, drifted SE; 27-30 Mar 09, occasional weak explosions reported. Shiveluch (Kamchatka, Russia): 20-27 Mar 09, seismicity at background levels; plumes likely rose to 6 km a.s.l. ; 23-26 Mar 09, fumaroles active; 24 Mar 09, explosions produced plumes to 8 km a.s.l. ; 25 Mar 09, ash plume drifted 40 km S; daily thermal anomaly detected. Suwanose-jima (Japan): 28 Mar 09, explosion; 30 Mar 09, three explosions. Tungurahua (Ecuador): 25-27 and 30-31 Mar 09, steam-and-ash plumes to 5.5-7.0 km a.s.l., drifted NW, NE, E and SW; 25 Mar 09, ashfall in areas to SW, lahars descended drainages to W; 26 Mar 09, multiples lahars descended drainages to W, SW and S.
The foregoing is a summary of the Smithsonian Institution/United States Geological Survey Weekly Volcanic Activity Report covering 25 March 2009 to 31 March 2009. It is provided for information only, and is based on but not a substitute for the full report, which comes with its own criteria and disclaimers. The map base is derived from the Smithsonian Institution/USGS/US Naval Research Laboratory This Dynamic Planet website.